I am lucky in the fact that I don't need to wear eyeglasses, but for the many people who do or for those of you who often wear sunglasses, looking through binoculars often can become really annoying and a long eye relief is probably a more important feature than magnification to an eyeglass wearer. The problem is what to do with your glasses when you want to use binoculars or a spotting scope. Many people remove them, put them down or wear them around the neck with a safety cord. This sounds simple enough, but doing it all the time can get really annoying and then there is always the risk of forgetting where you put your glasses and even loosing them. Especially important for bird watchers and those on safari where speed is important, the extra few seconds it takes to fumble with glasses can result in a missed rare sighting of a leopard as it slinks off into the bush or lost birding opportunity where the the extra movement may be just the thing that prompts it to flee. Eye defects like nearsightedness and farsightedness can be corrected by focusing the binoculars, but not astigmatism. With this condition you will need to wear your prescription glasses when you use the binoculars, or you will sacrifice valuable image sharpness. Some people who can wear contact lenses need not worry too much, but they also have their faults. They often require constant blinking to keep them moist, not ideal as most people tend to stare though binoculars, this can lead to hazy vision as the contact begins to dry out. The best solution for most people who need eyeglasses is to use the binoculars with glasses. This works fine as long as your binoculars or spotting scope has a long eye relief. The eye relief of a pair of binoculars, scopes or most other optical devices is how far back from the eyepiece your eye can be and still see the whole field of view. This is so important to eyeglass wearers, because your glasses hold the eyes back from the eyepieces. If the distance to your eyes is greater than the binoculars eye relief, you will see only the center section of the image. 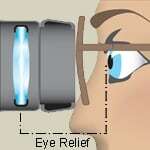 A long eye relief will allow you to wear your eyeglasses and see the entire field of view. Binoculars with short eye relief will give you a much reduced field of view sometimes less than half of the available field when you use your eyeglasses. Long eye relief binoculars are more forgiving. You can hold your eyes well back from the eyepiece and still see a full field of view. If you wear glasses, you will notice this difference right away if you were to compare the two. The width of the view you can see through the binoculars is called the field of view, a wide field of view field of view on a pair of binoculars has many advantages, not only is it easier to locate the object you want to focus on, which is especially important with fast moving birds and other objects, but it also improves comfort because your eyes will be more relaxed. It is kind of like having the curtains on a window fully opened as apposed to half shut. How Much Eye Relief Do you Need? In most cases an eye relief of 14 to 15mm is needed for the average eyeglass wearer to be comfortable. Ideally though you should look for binoculars and spotting scopes that have 16, 17 or even 18mm. Some very long eye-relief binoculars come with 20mm or more, which gives you plenty of room to maneuver. Please note that it is important that you check the figures before you buy as some manufacturers state that they have long eye relief when in fact they only have around 13mm!